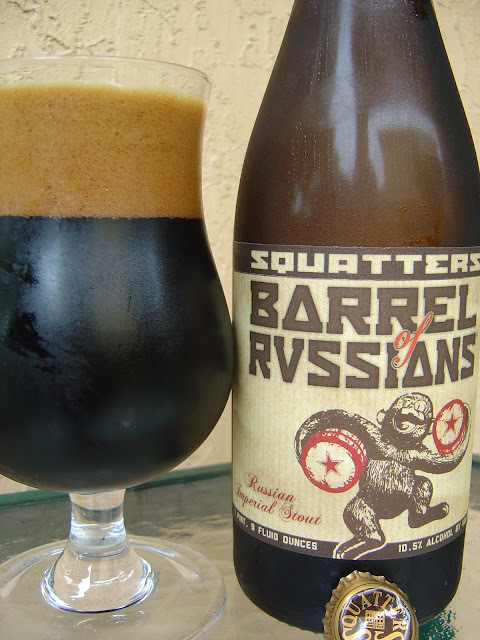 Today I'm drinking Squatters Barrel of Russians, a Russian Imperial Stout brewed by Squatters Brewery Pub in Salt Lake City, Utah. This wine-sized bottle was a gift from a friend of mine at the brewery. Thank you! The label features a dancing monkey holding two barrels and I think, based on his face and arms and features, that he is a play on the Barrel of Monkeys game. But of course this is no game. This is beer! There is a story on the side that first lets you know this beer was aged in High West Distillery rye whiskey barrels. Best opened after aging for one year, at 55°F - 60°F. Well, that means I screwed this up! There was no waiting or aging in this house tonight. But I do have a solution... I have another bottle to cover that year thing! Very black with a nice mocha-colored head. Rich cocoa and mocha aroma, caramel, wood, very welcoming. Rich cocoa flavors welcome you as well with a creamy smooth texture. Some dark cherries invade the Russian camp, and you will be certain to recognize their whiskey camouflage. OK. So, yeah, you taste the whiskey and the boozy 10.5% alcohol up front, throughout and forever, but it just seems to make you feel all funny and tingly, from the taste buds to the lips to the chest. I do think the suggested one year aging may take some of the edge off of the whiskey booziness, but I will admit I like this barrel's effects just fine, right now. Good body. Low to medium carbonation. Never sweet and never bitter. Great balance. Oh, and I did enjoy the the rich flavors more as the beer warmed from fridge temperature. Very enjoyable. Check it out if you get the opportunity.